I don't know what's going on but if you look at my screenshot you'll see that my solution explorer lists resharper's file as well as the ones I expect. 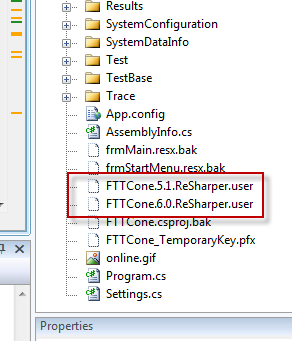 In another solution, I have some resharper files but those don't show in the solution explorer. I don't know if it's something in the solution file that's doing it or whether it's controlled by some configuration setting that shows all the files. It might not even be a Resharper problem. Anyway, does anyone have an idea what I can do to "remove" the files from the solution that I don't want included? I can't find any obvious "remove from project" setting that will do it. There's a "delete from project" but that's permanent. I'm happy to keep the files but I'd like to "hide" them to reduce the clutter. I've searched all the obvious settings but I can't see anything that will control it. It looks like you have 'Show All Files' turned on for the selected project (it can be turned on/off on a project basis.) See the attached screen shot. If you turn that off, the Solution Explorer will only show files that are actually part of the project. Thanks for putting a fool back on the road to enlightenment.